Click on the title above to view the full zoomable image. The image to the right is just one small part. This isn’t new, but worth another view. 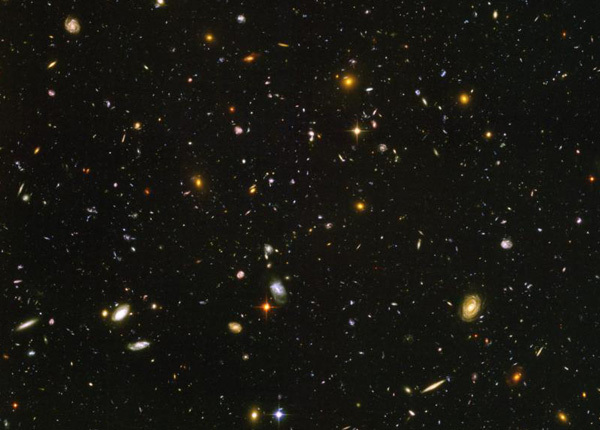 It’s one of the most distant images ever taken, making it one of our best views of the early universe. Keep in mind that the further out we look, the further back in time we see. Also keep in mind that every point in the image is a galaxy containing billions of stars. For many, this image is one of the most evokative ever taken. Looking so far away and so far back in time we see a soup of galaxies, each unique in appearance and composition. What kinds of geological or biological growth might there have been? And what is there now?